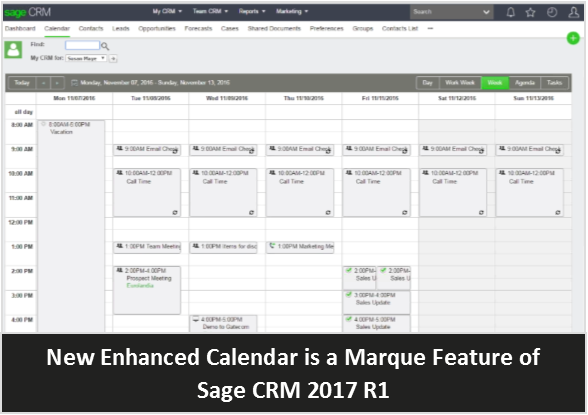 Sage recently introduced Sage CRM 2017 Release 1 (R1.). This latest version of the product features an enhanced calendar, new quick find search capabilities, an overhaul of the notification functionality, and over 50 customer fixes that have been addressed. Here’s a closer look. Flexible Views - easily switch between day, week, and work week views with detailed information about your tasks and appointments. Team Calendar - enhanced team calendar view makes it easier to stay up to date with your teams’ activities. New Agenda View - a new visual agenda lets you manage tasks and appointments on one list. Dedicated Task View - tasks are now available on their own tab for easy access and management. Customers should be delighted with the new features and design makeover as some have reported that the legacy calendar was somewhat cumbersome. An updated top navigation bar now allows you to easily search for and access CRM records and active notifications. New Quick Find - a more dynamic search function that looks across the entire application at once including standard and custom entity records. Improved Notifications - now appearing at the top of your screen, notifications have been revamped in order to reduce disruption and keep your workspace from being obscured. New Favorites Feature - organize favorite items and records and then easily access them with the click of an icon. A Secure Email Connection (via TLS) now allows you to securely access public mail services such as Exchange Online and Gmail directly from within the Sage CRM product, without the need for other software. In addition, the Sage CRM Help System now accesses help files that are hosted on dedicated web servers. By moving these files to the cloud, it reduces the size of your local Sage CRM installation and ensures that you’re getting the most up to date guidance. If you’re running Sage 300 integrated with Sage CRM, please be sure to check with us on compatibility before upgrading. Get in touch if you have questions, need assistance, or would like a copy of the fully-detailed Sage CRM 2017 R1 release notes.